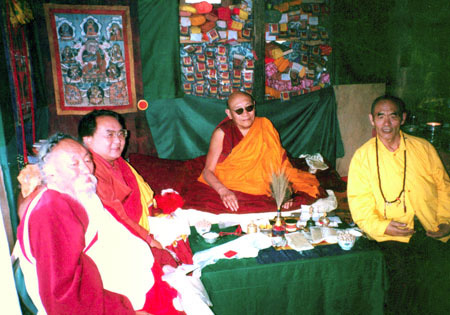 Chagdud Tulku Rinpoche, Sogyal Rinpoche, Trulshik Rinpoche and Nyoshul Khenpo in Maratika Cave, 1995. Maratika cave (Skt. Māratika; Tib. མ་ར་ཏི་ཀ་, འཆི་བ་མཐར་བྱེད་, Wyl. 'chi ba mthar byed) — the cave where Guru Rinpoche attained the level of a vidyadhara with power over life through his practice with the consort Mandarava. It is thought to be the cave of Haileshi in Sagarmatha, Nepal. This page was last edited on 1 June 2017, at 10:34.